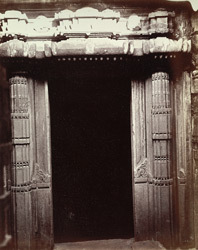 Photograph of the of the entrance to the shrine of the temple at Dhotra, taken by Robert Gill in 1871. The site of Dhotra has some temples built in the Hemapanti style of architecture which flourished in Central India under the Yadava dynasty in the 12th century. They consist of a sanctuary and a porch and the exterior is decorated with bands of mouldings but there is no figure sculpture. Henry Cousens who visited the site in 1902 wrote about one of the temples, '...The exterior of the temple is fully moulded in ornamental bands, but there are no images whatever, not even the usual three niches round the walls of the shrine. There seems little doubt that these temples more or less devoid of figure sculpture upon the exterior represent the true Hemadpanti class... '.